The savage Titans have escaped their eternal prison to wage war with the Gods once more.Their battles in the Overworld have spilled over to ours. Armed with abilities and weapons granted by their divine parents, the Scions stand as humanity’s only defense. These materials normally retail for $104.97, but in PDF form for the next several days, you can acquire all three supplements for $46.99 (USD). The Overworld’s gone silent, and the Scions are left to their own devices as they battle a renewed titanspawn offensive. But is the war already lost? Without word from the Gods as to what’s occurred, the heroes must master the powers of demigodhood, visit the World’s terrae incognitae and finally storm the Underworld itself in a desperate attempt to reach the Gods and save all that exists. The final battle has yet to be fought, and the future is undecided. Trusting that the inscrutable power of Fate will bear them to victory, the Scions press on, ignoring the lesser threats and taking the battle to the Titans themselves. 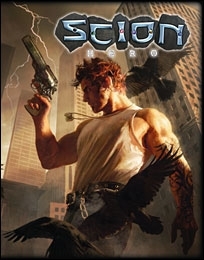 This book includes rules to take Scion characters to the next level of their development, godhood. The Destiny, Myth & Fate Bundle is available at the Flames Rising RPGNow Shop for a limited time only.